During the Dragon Attack at Willowshire! 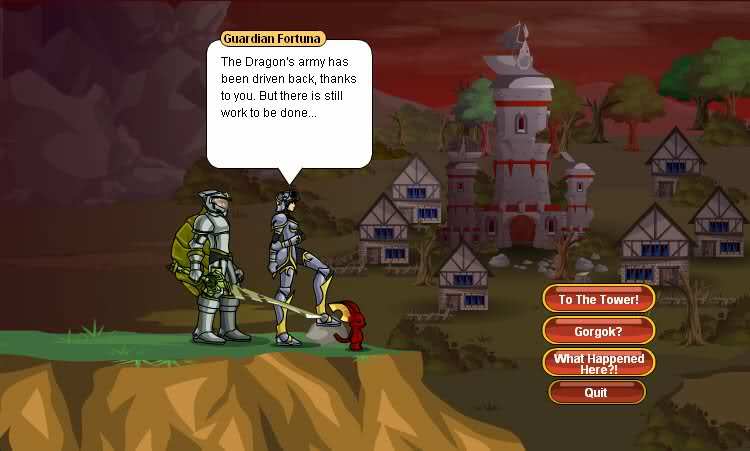 Guardian Fortuna: Thank goodness you are here, the Dragon and his army are destroying the entire town! Mission! - takes you to Willowshire Burns! quest. <Character>: What is the situation? Guardian Fortuna: They attacked without warning. The focus of their attack seems to be the Guardian tower! Guardian Fortuna: I was instructed by the Tower Commander to get as many villagers out of town as possible and call for reinforcements. Guardian Fortuna: But when I got back.... the Dragon and his army had already reached the tower! Twilly: Twillies brought as many people as Twillies could! Robina: I will do what I can to help! Ash: Let me at those Dragonheaded goons! Guardian Chuck: You can count on my blade! Guardian Steve: My spells are ready for battle! Guardian Bruce: I am ready for the hardest, toughest, most dangerous, and crazyiest missions you can throw at me! <Character>: I am at your service as well. Guardian Fortuna: By the light.... you are <Character>! If you are here, we can retake the town! Your fellow adventurers are already down there. Guardian Fortuna: There are a lot of us, so if we run strategic we can help those who are trapped and push back the invaders! Yes - adds Ash and Robina as Guest A and B, respectively. Robina, Ash, Twilly (in unison): Gorgok!!!? <Character>: .... who is Gorgok? Ash: The terror of TempleTerrace! Robina, Ash (in unison): The reaper of Redville! Robina, Ash (in unison): Hey, that was mine! Robina: Fine.... Ash, you are unjinxed. Robina, Ash, Guardian Fortuna, Twilly (in unison): Lets take Gorgok and his army down! Quit - returns you to Testopia. That is you... the Hero! House sitter? This house was sat on! The Baker's shop is toasted! The Guardian tower of Earth is almost destroyed! The weapon store is sold out! Gordok is one big, ugly, mean Dragon! School is closed on account of Dragon invasion. Hey! I can see my house from here! After the Dragon Attack at Willowshire! To The Tower! - takes you to the Willowshire Guardian Tower. Guardian Fortuna: I hoped that I would never see that day, but Gorgok has returned. Guardian Fortuna: We've been trying to rebuild since that dragon's first attack, but the Dravir that it controls destroy things as fast as we can build them. Guardian Fortuna: Dragon Lord <Character>, Do you think that you and <Dragon> could battle the beast? Guardian Fortuna: That will give us some hope of taking our town and our Guardian Tower back! Will you help us? Battle Gorgok! - takes you to Gorgok Returns! quest. Guardian Fortuna: A while ago the nature dragon Gorgok attacked our town. Willowshire was mostly destroyed as you can see. But Gorgok was defeated. Guardian Fortuna: After Gorgok's last defeat it flew away while its Dravir kept attacking anyone they could find. Guardian Fortuna: They burned our fields and our homes and set up a camp in our old town square. Most of the survivors went into hiding. Guardian Fortuna: Those of us who refused to run set up a resistance movement. Guardian Fortuna: We've been holding out for King Alteon to send us reinforcements but the Dravir have stopped every messenger that we have sent to Swordhaven. Guardian Fortuna: It took us months but we discovered that Gorgok was in a healing sleep in the hills near here. Guardian Fortuna: The dragon is heavily guarded by Dravir while it sleeps... not that we could hope to kill it even in it's sleep. Guardian Fortuna: We heard that you were showing up and Lady Celestia sent us a magic message telling us about you and your Dragon, <Dragon>. Guardian Fortuna: Her magic must be too subtle or too strong for the Dravir to block her messages to us. Guardian Fortuna: We believe that you have the power to defeat Gorgok or at least put it back into its healing coma. Will you help us? 1. The town was left in ruins ever since the Dragon Attack at Willowshire! war. 2. The Guardian Tower most likely held the Nature Orb before it was stolen by Valencia. 3. Replaced by Willowshire Outpost on August 27th, 2010 in order to gain access to Willowshire. -- Jay for current entry rewrite. -- PaperClip of DOOM for entry rewrite. -- Crynsos for original entry. -- Tolkienfanatic for dialogue information.